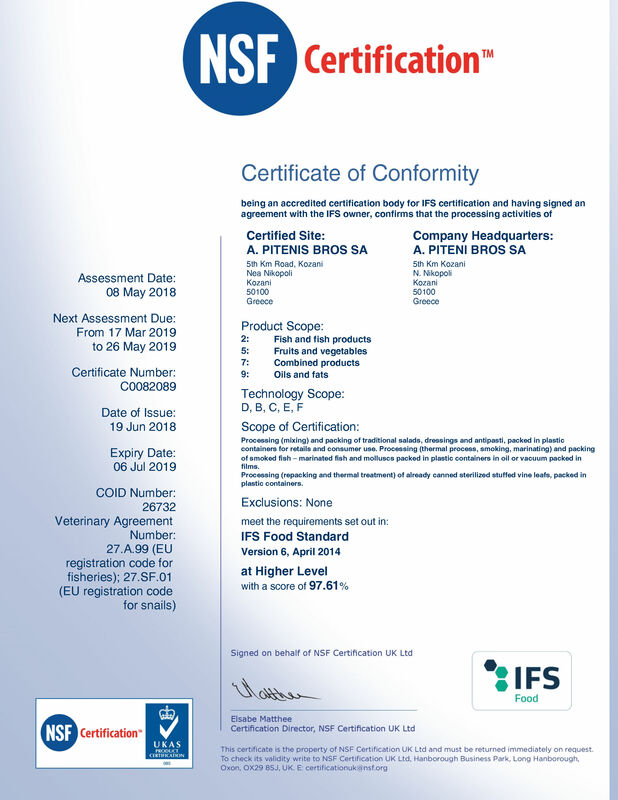 The certification according to standard IFS an important basis on which they can rely on food businesses to export their products in Germany and France, as more and more retailers in these countries seek IFS certificate from their suppliers. The standard regulation defines a quantified evaluation system filling the requirements and the evaluation result is expressed in percentage terms. So, customer of a supplier can quantitatively evaluate the performance of the supplier of. 1. Quality Management System, where the undertaking is required to identify the processes and prepare the food safety system based on 7 HACCP principles (WHO/Codex Alimentarius Committee). A. Pitenis Bros S.A. certified as to IFS the following areas: Production, Packing & Movement Traditional Salad, Pickle, Fish and Dressings, with the first try and extent 98% (higher level) without having to undergo any comments! .Click on a document for more details. History: A. Pitenis Bros S.A. certified by To ISO for the first time 2000. Since then till today renews and enriches the certifications according to each new certification standard to offer the public the increasingly higher quality! Today, is assurance procedures 2 even new, for this, standards, of HALAL & KOSHER.